Seeing the name Alex Proyas attached to any science fiction film should be an immediate assurance of greatness. What we are dealing with here is not just a specialist of his craft, but an artist and a visionary, celebrated by his peers for taking minimal concepts and developing them into something beyond expectation. Any moviegoer who was fortunate enough to get to see his "Dark City" during its brief 1998 theatrical run can vouch for this claim, as it remains perhaps the most imperative film of its genre in the last ten years (and more importantly, was seemingly responsible for providing a lot of the early ideas explored by the Wachowski brothers in "The Matrix"). Now, the very suggestion of seeing him at the helm of "I, Robot," a film inspired by the famous Isaac Asimov story of the same name, suggests that we may be in for a repeat scenario. Once a guy finds his true forte, after all, what's to stop him from going even further? Perhaps Proyas thought the same thing when it was suggested he take a look at Jeff Vintar and Akiva Goldsman's screenplay. Or, perhaps his desire to do this movie was so great that he never bothered reading the draft he had in front of him. Judging by the final result that appears on the screen, I opt for the latter. Like a gold medal athlete who returns to the game after significant injury, Proyas comes off here as a filmmaker who is in no way prepared to get back into the director's chair of a sci-fi vehicle, and "I, Robot" is the sad and mediocre product which results from that. The movie takes a big risk in even claiming to be inspired by the famous Asimov story, as it is so detached and separated from his vision that it emerges on celluloid as if it were a destabilized attempt at reworking an already-polished concept. The film stars Will Smith as Del Spooner, a smart and smooth-talking federal agent who, in the silence of night, dreams about a past tragedy and wakes up in a cold sweat (a factor, we gather, that is consistent since the movie bothers to show it to us on more than one occasion). Likewise, by day, he takes to the streets with a chip on his shoulder towards the future's most successful commercial export: Robots. Though their manufacturers insist that these mechanical beings exist only to make a human being's life easier and more convenient, Del is not so trustworthy (this even leads to a moment when he chases one down thinking it is stealing a purse, when in fact it is returning it to a woman who needs her medication). Why this is exactly is not for certain until later intervals of the film, but it nonetheless sets the groundwork for the plot. Almost as soon as he's back to work for a new day, Del is asked to investigate the sudden death of Dr. Alfred Lanning (James Cromwell), the head scientist at the U.S. Robotics Corporation, who is presumed to have thrown himself out of a high window and into the lobby of his workplace. The clues that Lanning leaves behind for Spooner, however, suggest that there may be more to his apparent suicide than meets the eye. Example: how can an elderly man throw himself through a window that takes considerable force to shatter? And considering that the scientist was nearly ready to unleash his prized new model of robot onto the world, why would he take his life? As they pile up, the unanswered questions help fuel the detective's already-cautious attitude towards the machines, and soon it becomes apparent that one of them (named "Sonny") may have been the culprit in the good doctor's demise. The plot follows that standard element of surprise required of fueling the premise - no one believes the main character is having anything other than misguided paranoia, but in the end his aggression may carry a lot more substance than previously thought. The ironic thing here is that this is a concept destined to work, filled with social commentary on human error and interesting dialogue regarding the nature of our creations and the laws of evolution. But Proyas makes two serious errors in his quest: 1) he strays very far from the source material, making it seem fruitless to even reference it to begin with; and 2) he forgets that in order for there to be interest in the outcome, there must at first be tension. He only provides us with one grounded scene in that regard, in which Spooner is on his way home when a shipment of new robots is set loose on the open roads and try to dismantle his car while it is still running. There is a suggestion here that the scene is inevitable because of the detective's unflinching interest in a case scenario that irritates those in charge at the Robotics Corporation, but you get the impression that its only true motivation is to show off some nifty new special effects shots. This is a science fiction endeavor that seems more interested in flexing its visual muscles in the mirror than anything else. And even then I might have been okay with the result had it demonstrated a hint of genuine inspiration, but alas it does nothing of the sort. Proyas' visuals seem so static at certain points that you wonder if he was only interested in replicating backgrounds from early storyboards instead of adding anything noteworthy upfront. The mechanical beings themselves, an apparent hybrid of traditional robotic attributes and a physical façade that is more human than machine, are not that particularly interesting; no, not even the one they refer to as Sonny, who can't be seen as anything other than a talking device even when he strains at serious questions and reveals human traits in reaction (something which the robotics people, we gather, have never bothered implementing in their creations). No doubt there was a dedicated vision the director had with these things, but I'm not completely sold on the outcome. One almost wonders if even he can admit that his computerized creatures are a pale imitation of a much greater goal that was never realized. 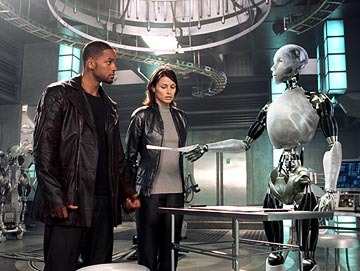 I did not actually hate anything that "I, Robot" had to offer - but then again, I didn't exactly admire much of it, either. That perspective, obviously, creates an interesting vacuum for the movie critic when it comes to issuing a final rating - do you award the movie points for not being as bad as it could have been, or reject it completely for falling flat on its face? Because we are dealing with a filmmaker here who is as talented as he is fascinating, a bit of middle ground is only fair. In either case, one would hope that his ultimate failure is simply a minor lapse in judgment instead of a possible sign of things to come. Proyas knows how to make movies - but for his sake and our own, let's hope he remembers that the next time around.